When it comes to safety while riding, getting an excellent helmet is the priority! Our range of full face helmets were selected to cater for every type of rider and style; With your safety as our priority, we only provide helmets which have been officially certified by respected governing bodies. All our helmets come with Free UK Delivery and the option to Return or Exchange your helmet within 30 days. 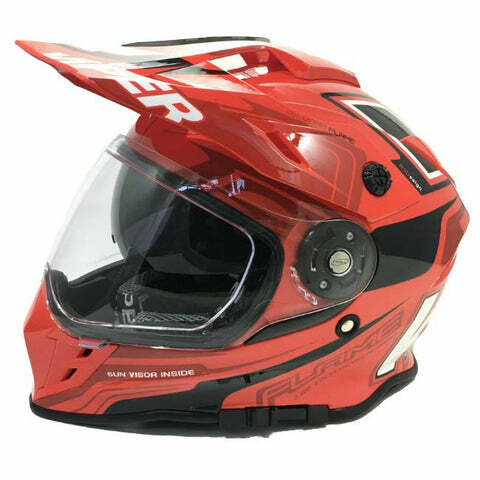 The Viper RXV288 is an all round on-road, off-road and adventure helmet with an aggressive design to suit all style of riders. 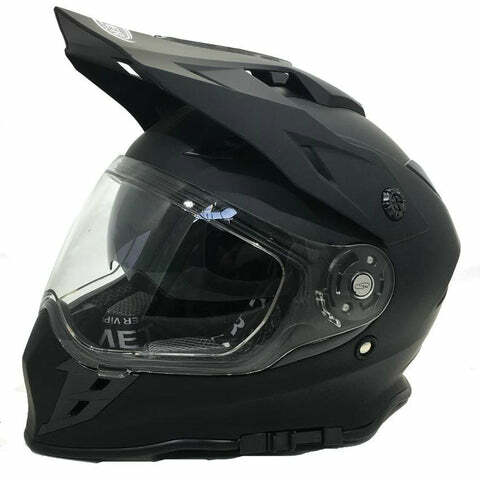 A removable motocross peak keeps with the adventure style but can be easily removed and used as a full face helmet thanks to the wide vision visor. 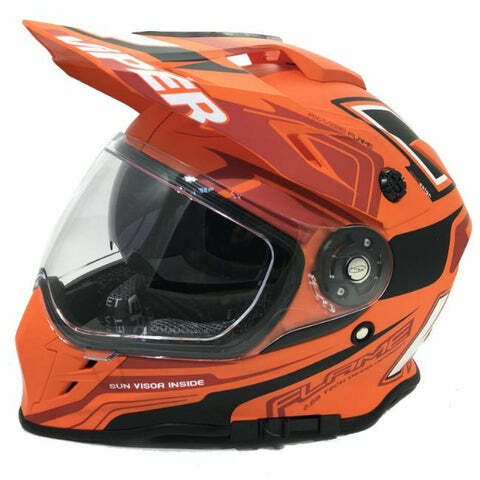 For off road use, just remove the main visor and use goggles or the internal drop down sun visor to protect your eyes. Full face helmets are a favourite for most motorcyclists thanks to their generally higher safety ratings when tested, and their ability to keep the outside conditions away from your head unlike other helmet types which have more openings. 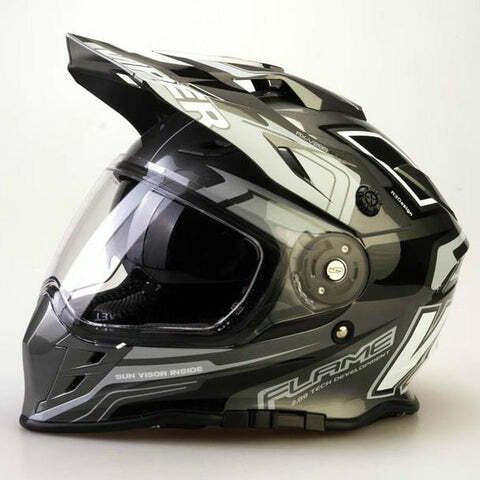 Our range of full face motorcycle helmets includes a style and design for every type and style of biker, whether you want a lightweight lid for your track days, or a bright lid to make you stand out on the road; meaning LDMotorcycles.co.uk is the first and last place to look when you’re in need of a new full face helmet. 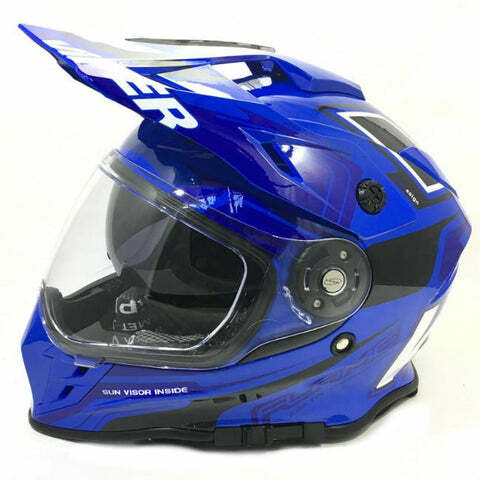 Within our selection of full face lids there are loads of helmets with special features and specs to make your ride more comfortable and enjoyable, such as DVS (Dual Visor Systems) sun visors which can be engaged within seconds at the touch of a button to protect your eyes from the sun, plus integrated Bluetooth headset areas within the lining of the helmet to make it easier for you to mount your headset control unit on the inside of your helmet. These are just a couple of the great features that are available with many of the motorcycle helmets in the LDMotorcycles.co.uk range.